Reporting on the world from the US, Irving Berlin had learned institutions are less important than individual relationships. separated from the Western world. Lenin, changed the USSR ecology, made it differed from that of the U.S. One demanded silence, the other thrived on cacophonies. Russians had suffered during the czars but Stalin's suffering was different. It was Marxian as interpreted by revolutionaries who felt truth did not exist, me flowed slowly, someone had to organize and lead people into a national planned system. Marxist/Fascists followed the true correct theory, judgment was not needed. They knew answer in advance so contradictions could be ignored as they would be removed by the flow of time. Being correct provided the confidence needed to not fear the future. by J. V. Stalin 9/38. He had no theory beyond his own ability if he was in control. His self confidence did not come from a search for truth. He learned to live with incompatible alternatives. He was a juggler, knew importance of balance, was not consistent but could see the big picture and create balance by knowing the importance of scale. He managed variables need to balanced goals with resources. The BEAR was needed to stop Germany, Victory required denial of justice and Justice required denial of victory. FDR no guaranties for Baltic and Poland, we need Russia, FDR said screw Poland. It would be the US and USSR deciding on direction, no morals or ethics involved. Oliver Wendell Holmes- said of FDR, "a second class intellect but a first class temperament. 5. Grand strategy requires the directional compass of intellect and a gyroscope to provide for a balanced temperament. Complexity requires intellect to determine course which requires adjustment which combined with temperament to determines how adjustments. the conqueror couldn't balancing aspiration with capability and lost an empire. Lincoln save a country by not doing so. FDR the juggler balanced important variables. a species by combing habits of Berlin's foxes when adjustments to rapid changes are needed and like hedgehogs to thrive in stable times. He believed good judgment required a balancing act that requires rethinking core assumptions while preserving our existing world view. Risk is accepted by low expectations using proven means for achievable ends while subjecting theory to corrections. Required No compatibility, no convergence with theory when subjected to experience and corrections. Pluralism was required which Berlin felt created a dynamic, antagonistic, discontented world...The contradiction of life and death is the greatest we will behold, almost all participants deserve respect. 6. Good judgment assumes Moral equivalents across opinions with equal cost from failure. Berlin saw WW 2 Politics as a polarity with in equivalent concepts of Liberty at either end. with disposition and the possibility of slavery or even extermination. Risk was lessened or postpones with a promise of treasure. because with compatible of means, ends automatically converge. All knew how world worked, allowed little opposition. In 1962 RFK response to a Mexican War question was taking Mexico by force was probably incorrect. It cause Deep Do Do. Should we give Texas back. Most would say no. The resulting justice would cause chaos and too much injustice would result. Contractions exist. Learning to live with history means living with incompatibles. Grand strategies helps because all fair deals are based on proportions, the item received must be in balance, be in proportion to that paid. Grand strategy aligns desires with ability. Fairness is helped by bending toward freedom or negative liberty. could not control his fears. No balance meant a poor team. and then Athens soon followed. Philip II micro managed a vast empire that pivoted down. align end to means and began the replacement empire. Napoleon confused aspirations with capabilities, failed to align end to means, lost a war and went to prison. won a war and saved his country. Wilson the builder failed to align means to ends and maintained justice but lost a League. Lincoln align end to means, balances politics and military, won a war and saved his country. "Like �Makers of Modern Strategy-FROM MACHIAVELLI TO THE NUCLEAR AGE,� it explores the facets of wisdom, temperament and courage that create great leaders and enduring empires. �On Grand Strategy� begins with the Persian king Xerxes � invasion of Greece in 480 B.C., an invasion that went spectacularly wrong. Xerxes suffered from an inability to connect the ends he desired�control of Greece and ultimately all of Europe�with the resources available. Xerxes was not the last warrior-king to suffer from that particular affliction. Napoleon underestimated Russian winter and the will of Russian peasant even before he met defeat at Waterloo. Hitler had troops invade Russia in summer uniforms expecting quick victory but another cruel winter took its toll. These leaders were like Isaiah Berlin figures. They were hedgehogs over-focused on a doctrine or an objective and failed to adapt to meet the current situation. Gaddis respected foxes more. They hold fast to objectives and adjust their tactics to difficulties�geography, weather, time, public support. Desires often overwhelm available means requiring a strategy set priorities, build alliances and conserve resources. Mr. Gaddis presents an array of leaders who mastered this strategy method. Queen Elizabeth I understood British geography strength and her sea power would keep her safe. Abraham Lincoln adjusted his thinking on slavery from wanting to block its growth to arming free blacks to emancipation of slaves held in belligerent territory. Franklin Roosevelt focused on the greater strategic threat Germany rather than Japan who had struck first. They all choose historically successful strategic principles that Mr. Gaddis feels will work in the future. Not a perfect book, On Grand Strategy short-changes Eastern tradition and doesn�t effectively analyze how the nuclear revolution affects military strategy. 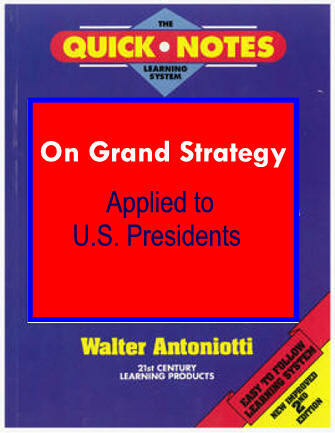 He shows many leaders with few strategy skills led their countries poorly. Gordon M. Goldstein is an adjunct Senior Fellow at the Council on Foreign Relations and the author of �Lessons in Disaster: McGeorge Bundy and the Path to War in Vietnam. Elizabeth I defied traditional expectations by �... tolerating (within limits) religious differences...� Rather than impose a grand design, she responded deftly to her changing world. Napoleon failed because of limited �peripheral vision� blinding him of �landscapes, logistics, climates..." troop morale and enemy strategy.� Abraham Lincoln was astoundingly intuitive, managed polarities: they didn�t manage him.� FDR had a Second Class Mind and a First Class Temperament according to O. W. Holmes.